I'm pretty good at math, it is logical and helps you see order. My checkbook is always balanced to the penny. When I cook, everything is finished at exactly the same time. And I lost 15 pounds recently by approaching it like a math equation (I'll blog on that soon). So, it should be no surprise that I approach my clothing choices in the same way. Now, I buy what I like and this post will talk about some of those individual choices. But the way I put them together is where the math comes in. Again, my mom taught me this (thanks mom!). She saw it in some book or magazine in the 70s and taught it to me in junior high. I've "counted" ever since. The point of this excercise is to have a well put together look, a balanced outfit. You may have heard the advice, "Always take off one piece before you walk out the door". It's kind of like that (but you may find that you need to put on one piece before you walk out the door). 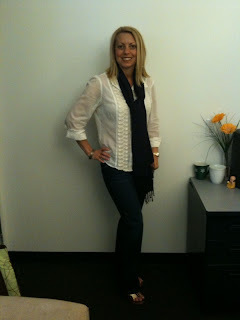 I'll show you how it works with a few of the outfits I wore last week. 1 point - Black peep toe heels, I don't like chunky heels and usually go with a stiletto. 2 points - Earrings, Jay got me these stunners for my birthday and I'm sorry you can't see them better, but you get 1 point per earring. 1 point - Painted toe nails, it's called I'm With Brad... bought it because of the name. Commentary: I usually end up around 10 or 11 points for work and maybe 12 for casual/evening. There is no RIGHT number. It's what you feel comfortable in. But I think 10 is perfect for me, no pun intended. 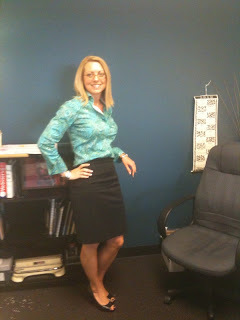 Pencil skirts are a staple in my wardrobe, I have them in several colors. They always look classy, they go with any type of shirt, and they raise the bar on the hot factor. 2 points - Cardigan, you get 2 because it is patterned remember. I LOVE this sweater, it has satin piping on the edges and makes me feel good. 1 point - Tank, some could argue it gets 2 points because of the lace edging, I wouldn't disagree. 2 points - Necklace, this is a really bold piece that my friend Debbie made me. It's gorgeous and was the perfect accessory for my v-neck cardigan. 2 points - Brown faded to caramel peep-toe shoes, you can sort of see the fading color in the back. Commentary: I got a lot of compliments this day. I felt great and it showed. That, my friends, is a great reason to dress well. Here's what happens- you look good, you feel better, people notice, they compliment you, you thank them, everyone gets a dose of happiness, you are making the world better. See? Save the world. 2 points - Button down shirt, this shirt is awesome and has amazing button and rope detailing down the front. 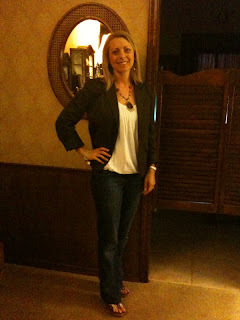 1 point - Jeans, dark wash jeans make you look skinnier, boot cut jeans make you look taller, these are NOT mom jeans. 2 points - Brown and gold wedges, these were new and for an almost 5-inch shoe they were comfortable from 7am to 10pm... I swear. 2 points - Earrings, I can't see them and I don't remember what they were but I wouldn't have walked out the door without them in this outfit so 2 points it is. 2 points - 2 rings, I added a big topaz ring that was my Grandma Luceil's on my right hand. 1 point - Pashmina, that's a big scarf. Commentary: This was a no-meeting day and was my Friday (even though it was Thursday). I almost always wear denim on Friday's because I dress up so much during the week. There is a different feeling when I wear denim that gets me in the mindset to relax a little and go into the weekend on that note. If your clothes don't effect your mood, then you need better clothes. 1 point - Jeans, do I need to mention they are supposed to cover your heels? At most, they are an inch off the ground. Too short pants are a huge epidemic. 1 point - Brown blazer, nothing makes you look put together like a blazer. Make sure it's a little fitted. I rolled up the sleeves to give it a more casual look. 2 points - Brown and gold wedges, same ones as the day before. 1 point - Necklace, this one is awesome. It's a peacock feather with beads. New fave. Commentary: I wore this outfit traveling back to Oklahoma. It worked great in the airport and took me into hanging out with the niece and nephew, then to dinner with my parents. I could have worn this to work, a party, shopping, really almost anywhere. If you dress with "style" you can make an outfit work for lots of occasions. A good rule of thumb is to start with 3 pieces. A shirt, skirt/pants, jacket/scarf/cardigan. It is a great base to creating a good ensemble. You'll get a good 3-5 points out of this. You must add accessories. You'd never give a present without a bow on it or a card with it, right? This is how you pull it all together. If your clothing is solid colors or fairly plain, add pizzazz with shoes or jewelry. Once you figure out your "number" then you know how MUCH you need to add. In general, if you are a 6-8 you need to do a little something extra. If you go into the mid-teens, you may want to consider toning it down. With that said, you have to take into account what makes you FEEL comfortable too and if your personality dictates that you need to be more elegant, then 8 it is. If your personality is bubbly and fun and you want to show that, then 15 could work. The Point System does use the left and right sides of your brain. Good, it will make you smarter. And looking good is just the bonus. Would love to hear your thoughts and hear what your number is (not THAT number though, okay?). It was 1965 and it was from Modeling and Charm School. I usually wear a 10 or 11 which includes a purse. Love how you added to it. I forgot underwear today. Is that a minus? Speaking of minus, my vote is that animal print would be a minus. How many zebras had to die in the making of Wednesdays outfit? Although, nimal print on shoes is hot, so that is a plus. Can a wedding ring be counted as a point? Shouldn't you always be wearing that? I think we need your mom to rule on this. Thanks Mom for clearing it up! Chelsea- let me know how the jeans thing works for you. I swear, jeans are a different mindset! Noah- Yes, you are negative if you forgot underwear. I think my mom is going to vote that the wedding ring should count for like 3 points, just cause I waited so long! Noah, bling is bling even if it is a wedding ring! I love this post. You are such a style maven. We need more posts from you about style & fashion. I am usually a 9 or 10 when I leave the house, though I admit I love the casual. 5" heels?? You are crazy. I've learned a good a good necklace can transform an oufit. Your mom rocks. Thanks for putting so much energy into supporting us looking good in the world!